On Friday, the Blackhawks sent forwards Kris Versteeg and Joakim Nordstrom to the Carolina Hurricanes in exchange for a pair of young defensemen and a future draft pick. The move was made purely to free up enough cap space to re-sign Marcus Kruger before training camp begins on September 18th. Literally moments after it was announced that the Hawks had made this trade, it was also announced that they had in fact given Kruger a new one-year contract worth about $1.5 million, which is a huge bargain for the Blackhawks. As it stands right now, the Hawks sit roughly $900,000 below the league salary cap. Doesn’t it seem like just yesterday that the Hawks pulled off that late-night trade with the Florida Panthers to bring Steeger back to Chicago? Now he’s already on his was to a new team after winning another Cup with the Hawks. While it somewhat hurts to see him go (simply because of his personality and off-ice likability), it is a move that had to be made. The Hawks needed to dump some salary to make sure that they would not lose a guy like Marcus Kruger. My belief is that Nordstrom was thrown into the deal to eliminate a bit more salary from the budget, but to also get Carolina to take Kris Versteeg who struggled mightily most of last season. As for Kruger’s new contract, I’m seeing this as a classic “bridge” deal. What that means is that they signed him for an amount that would benefit the team this year given their cap constraints, and will likely sign him to a much more deserving and accurate contract next offseason. Kruger is without a doubt worth more than $1.5 million for one year and probably could have easily gotten a much larger contract had he decided to look elsewhere. That he took this deal to stay with the Hawks says a lot about his desire to stay in Chicago and help the team win on and off the ice. If you didn’t like the guy before for whatever reason, it’s hard not to now. I believe that the Hawks are likely still doing what they can to try and move Bryan Bickell, which would free up another $4 million from their salary cap, however I think trading him is unlikely. As was the case with Versteeg, any team is going to want something or someone along with Bickell. Trading him straight up for anything will be difficult for Bowman to pull off simply because of Bickell’s contract, and I doubt he wants to lose even more assets from the NHL and/or AHL roster via a trade. At the same time, it would make a ton of sense for Bowman to sign or acquire a veteran d-man to avoid having to rely solely upon the likes of David Rundblad and Trevor van Riemsdyk on the Hawks’ third defensive pairing. If he can do so and spend less than $900,000 in the process, great. Otherwise Bowman will have to find a way to shed more salary from the NHL roster, which brings us back to Bickell in what becomes a repetitive sequence. In fact, today it was reported that the Hawks will be bringing 37-year old defenseman Jan Hejda to training camp on a “tryout” basis. His four-year, $13 million contract with the Avalanche expired at the end of last season, so he is looking for a new home. And in all honesty, he’s not a bad option to at least consider. He’s been a rather reliable defensive defenseman throughout his career, and he definitely brings that veteran presence that the bottom pair needs. If he impresses the Hawks in training camp, we may see them extend a contract offer. For now though, he’s just here on a tryout, contract-less basis. It’s been a relatively slow past couple of months for the Blackhawks, who seem to be waiting as long as possible before making some final contract and roster decisions. In the meantime, they’ve been waiting for any new details in the whole Patrick Kane case. With training camp being right around the corner, here’s what to look for in the coming weeks. First of all, let’s just get this one out of the way. 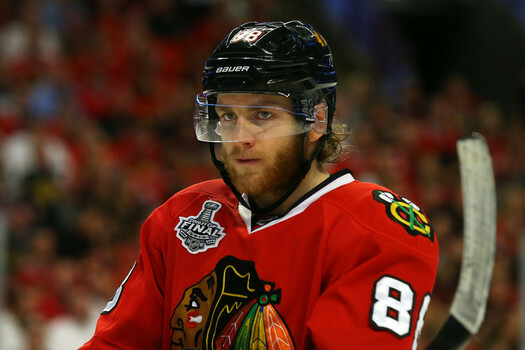 Patrick Kane’s alleged sexual assault case was set to be heard before a grand jury yesterday, only to have it postponed out of nowhere at the last second. This has led some to believe that Kane and the accuser could be working out a settlement, though nothing has been confirmed. The Blackhawks are surely keeping close tabs on this situation as it significantly affects how they construct their roster heading into this season. As it stands right now, it would be a safe bet to assume that unless the Kane accuser drops this case, he could be missing some games to begin the season. The number is anybody’s guess. That could be determined by A) how this situation unfolds between him and the accuser, and B) how the NHL and NHLPA decide to respond to whatever ends up happening with Kane. In addition, it’s not out of the question that the Blackhawks could decide to enforce their own punishment on Kane depending how the case plays out. Rumors have already begun flying that the Hawks could look to trade Kane regardless of what happens with the allegations. The best way to approach this situation as a fan is simply by letting it play out. Let the sexual assault case play itself out before anything else. Marcus Kruger is still without a new contract. The Hawks seem to be waiting on something before extending Kruger an official contract offer. There’s no question that the Hawks want to keep Kruger on the team for the foreseeable future and are waiting for the right time to make him an offer, but at the same time, they don’t want to let this thing play out for too long. 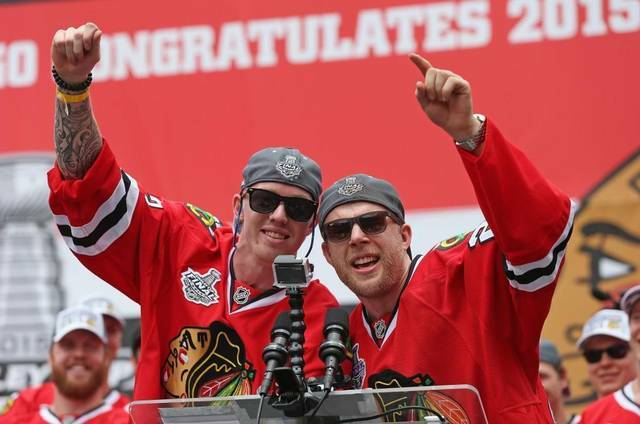 Bryan Bickell and/or Kris Versteeg could get traded quite soon. With training camp knocking on the door, the Hawks will want their roster to be virtually finalized before heading to South Bend. Going back to the Kruger situation, it could very well be that the Hawks are waiting to trade either Bickell and/or Versteeg before making Kruger an offer. Freeing up some cap space would make things a lot easier on the Hawks when offering contracts. If the Hawks can trade one or both of the previously mentioned trade candidates, we might see them not only re-sign Kruger, but also sign a veteran defenseman who could either play on the third d-pairing, or at least offer some competition for guys like TVR, Rundblad, and Svedberg. The Patrick Kane stuff is what has been and will continue to dominate the Blackhawks’ headlines, but that doesn’t mean other important stuff won’t be happening. One question I think we all have is if Kane is suspended for a significant amount of time (and the possible terms of any suspension are completely unknown right now), would that have an effect on the Hawks’ salary cap situation? I’ve heard multiple answers to this question, some of which from professional hockey writers and analysts. No one seems to have a definitive answer, which makes the whole situation that much more difficult. For now though, keep an eye on Stan Bowman. A trade or two could be on the horizon. This morning, the NHL announced that the salary cap for the 2015-16 season will be $71.4 million; about $2.4 million higher than this past season. This is decent news for the Blackhawks because they need the cap to go up as much as possible if they want to retain players like Saad and Kruger, among others, for next season. Had the cap been any lower than $71 million for this upcoming season, it would have been a big disappointment for many teams like the Hawks. What the announcement of next season’s cap means is that trades and other moves will begin to take place, and in a hurry. Odds are that not much will happen prior to Wednesday night’s NHL Awards Show in Las Vegas, but who knows? One thing is for sure, and that is that we are bound to see a flurry of trades before the start of the NHL Draft on Friday. With regards to the Blackhawks, this implies that a big move or two could come between now and Friday. The Blackhawks traded away a number of draft pick for this year’s draft back at the trade deadline a few months ago, and odds are that they’ll be looking to acquire some picks heading into the draft of Friday. To get those picks, they will most likely be looking to dump at least one big salary. Patrick Sharp’s name has come up more than just about any player in hockey in recent weeks when discussing possible trades. He is set to make $5.9 million per year over the next two seasons. It’s no secret that the Hawks will be looking to move Sharp in return for some high picks and a prospect, but whether or not they can strike a deal with a team over the next 72 hours remains to be seen. I don’t think any of us Hawks fans want to see Sharp go, but it is a move that has to be done. Brandon Saad is a huge part of this team’s future, and really the only way to give him a contract that he deserves is by moving a player with a big annual salary like Sharp. Other candidates to be traded out of Chicago are Bryan Bickell, and possibly even (but not likely) Brent Seabrook and/or Corey Crawford. All three players have big annual salaries and would bring a lot back to the Hawks if traded. Odds are that both Seabrook and Crawford go nowhere, but their names have been mentioned in trade rumors. The ideal scenario would be if Stan Bowman could find a buyer for Bryan Bickell. Bickell is set to make $4.5 million annually for the next two years, which is way too much money. Why Bowman ever inked Bickell to such a deal, I don’t know. It was probably a knee-jerk reaction to the way Bickell performed over the course of the 2013 playoffs. Trading away Bickell, who is definitely replaceable from within the organization, would free up a lot of cap space and go a long way in re-signing Saad and Kruger first and foremost. If this deal is made, it by no means implies that Sharp won’t be traded. If I had to bet on this, I’d say Sharp is dealt before any other Hawk. Being able to dump Bickell’s salary would just be a bonus to Stan Bowman. Patrick Sharp being traded away, and probably to an Eastern Conference team, in exchange for a first round pick in this year’s draft and a good prospect or two. Maybe even a Bryan Bickell trade if Bowman can work magic. Bickell would likely bring in a couple 2nd-4th round draft picks and nothing more, especially if another team agrees to take on the majority of his contract. We may see the names Seabrook and Crawford float around in the rumor mill, but I wouldn’t expect either one to go anywhere. Once Sharp and anyone else are dealt, extensions for Brandon Saad and Marcus Kruger should follow shortly thereafter. 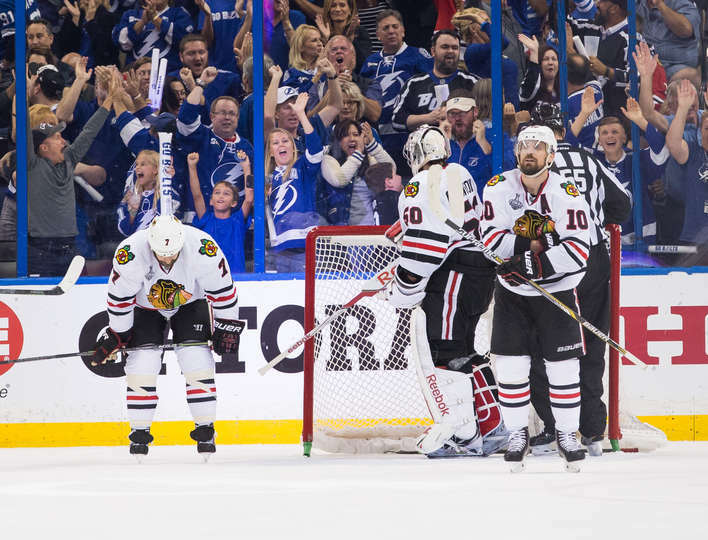 After a surprisingly low scoring first game of the series between the Blackhawks and Lightning, we finally got what we were all expecting in Game 2: a fast paced, relatively high scoring track meet. Each team traded goals throughout the game until Tampa Bay struck for their fourth goal roughly half way through the third. The Blackhawks could not answer, and the game ended 4-3 in favor of the home team. Series tied 1-1 heading to Chicago. All things considered, the Hawks shouldn’t be too upset about coming home with the series tied at one. Their goal heading into the first two games in Tampa was to win at least one and gain home ice advantage in the series. They did just that. The disappointing thing is that Game 2 was definitely winnable, but they let Tampa Bay off the hook. Had the Hawks pulled off another victory last night to go up 2-0 in the series, this thing would be all but over. Corey Crawford did not have his best game. There’s no doubt about that. Tyler Johnson’s goal to make it 3-2 should have never happened, but it did. Crawford looked a bit shaky pretty much the whole night while allowing four goals. Having said that, aside from Johnson’s goal, you can’t really blame Crawford too much for the other three. On Tampa’s first goal of the game, Crawford was heavily screened and never had a good look at the shot. Their second goal, scored by Kucherov, was another crazy redirect giving Crow no chance of making a save. And their fourth goal came via another deflection, only this time the puck hit Andrew Desjardins’ stick. While Crawford did admit that he needs to be better, I don’t think there’s anything to be concerned about here. 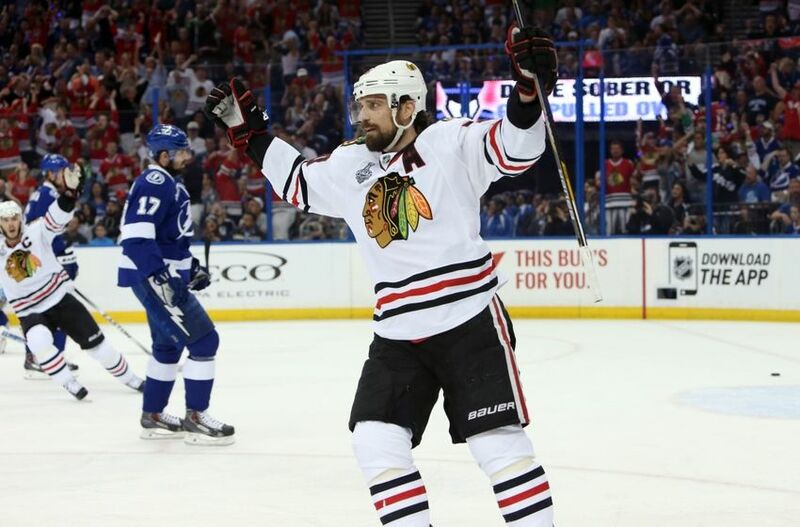 Tampa Bay has scored some crazy goals this series, and there’s not much Crawford could do. Toews, Kane, and Saad were held quiet again in Game 2. Give Victor Hedman, Anton Stralman, and the Cedric Paquette line credit for shutting these guys down. Towards the end of the game, Quenneville did elect to place Kane back on the second line while moving Hossa back up with Toews and Saad. With the series now shifting to Chicago where the Hawks will have the last change, it’ll be interesting to see if Q goes back to the Toews, Kane, and Saad line knowing he can now dictate the matchups. My guess is we will see this for at least the first period of Game 3. If that line is still not producing, then we’ll see Hossa back with Toews, and Kane with Richards. One thing to note is that in the 2010 Final against Philadelphia, Toews and Kane did nothing in games 1 and 2. They then woke up and came up big in games 3-6. In the 2013 Final against Boston, neither player did much of anything until Game 4. Those two both scored that game and were unstoppable the rest of the way. Ben Bishop left Game 2 in the middle of the third period for about a minute, then returned to the ice. After a couple minutes back in the game, he left again, only this time he didn’t return. I thought for sure he was just sick or something like that, but it’s sounding more and more like this could be an injury. If that’s the case, there’s a good chance he’ll be on the bench Monday night meaning Andrei Vasilevskiy will get the start in goal. Vasilevskiy has 8 career NHL wins as a rookie this year. If he’s in net, the Hawks will need to quickly figure out how to beat this guy. We’re already two games into this series, so there’s no more time for a “feeling out” process. While this kid has some major talent and upside, this is still a tough spot for him to be called upon. The Blackhawks need to take advantage of that right away. The back-to-back penalties that Patrick Sharp took in the third period Saturday night were obvious penalties that had to be called. The Hawks killed off the first one, but weren’t quite able to do the same on the second. He took full responsibility for this, but the fact of the matter is that the Hawks can’t do that again. You can’t take two straight penalties in the third period of a tie game. Kyle Cumiskey may have played his last game of the series last night. He committed a costly turnover right before the Lightning’s first goal and wound up with a team-low 5:08 of ice time. Joel Quenneville said today that Trevor van Riemsdyk “could play” in Game 3, meaning he probably will. Depending on how well he plays in Game 3, he may not leave the lineup the rest of the way. David Rundblad had a better Game 2 than he did in the first game of this series, so odds are he’s not going anywhere. After a very effective Game 1 performance, Kris Versteeg wasn’t as noticeable in Game 2. Like with TVR, Quenneville stated that Bryan Bickell “could play” Monday and that he thinks he’s healthy. If that’s the case, Bickell will be back for Versteeg in Game 3. This could open up more space for Patrick Kane if Q elects to play Kane on the second line. The Blackhawks made it clear that they are now looking forward to coming home for the next two games and feeding off the fans at the UC. Just like the Lightning did on their own ice, I’d expect the Hawks to come out flying to start the game Monday night. If they can get an early lead and build on it, they’ll be in good shape. It will be pretty interesting to see which matchups Q will chase now that he gets the last change, but I’d have to believe he’ll try and get the Toews line out against any d-pairing besides Hedman and Stralman. No coach is better at getting favorable matchups on the ice than Q. Game 3 is a big one. If the Hawks win that, then all the pressure in the world again shifts to Tampa Bay for Game 4. 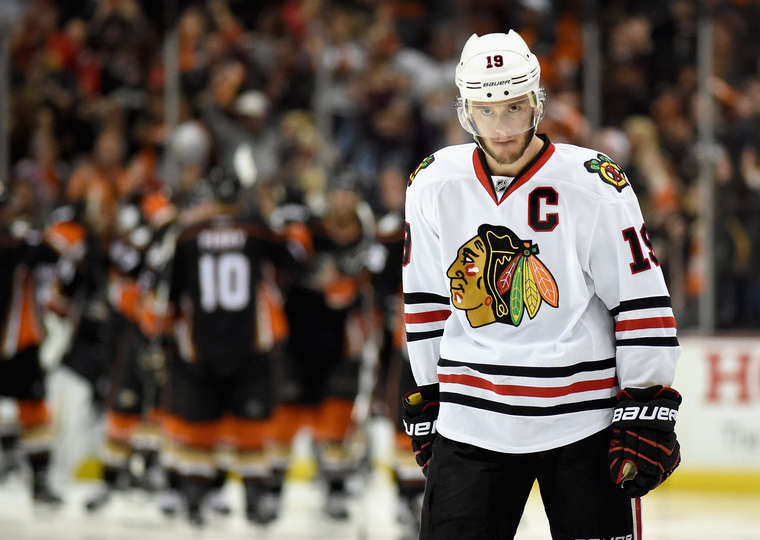 The storylines now surrounding Game 5 between the Blackhawks and Ducks are pretty straight forward and don’t need much more recognition. Anaheim struck three times in the first period to take a 3-0 lead in the game, only to have the Blackhawks come storming back and tie it with less than a minute left in regulation thanks in large part to the miracle that was pulled off by Jonathan Toews. The game would head to overtime, again, and the Ducks’ Matt Beleskey scored the game winner just 45 seconds in. Ducks 5, Blackhawks 4, with the series headed back to Chicago for a now must win Game 6 for the Hawks. First and foremost, that opening period was dreadful. It was probably the single worst period of the season for the Blackhawks. They came out flatter than the Great Plains and watched Anaheim skate circles around them with the puck. It was embarrassing to say the least. The Hawks managed just three shots on goal in the period, with their first one coming late in the frame. Only they know why they came out so slow and disinterested, and we can only hope we never see that again. As a result, the Ducks netted three goals and probably could have had a couple more. The Blackhawks had a lot of trouble clearing the puck out of their own zone/getting the puck in deep to Anaheim’s end, and this directly resulted in at least three goals for the Ducks. The two most notable instances of this were the Ducks’ fourth and fifth goals. On their fourth goal, Kimmo Timonen chipped the puck to Patrick Sharp along the half boards to Corey Crawford’s right. Instead of then moving the puck into open ice up the middle and out of the zone, Sharp tried to get it out along the boards. The Ducks held it in and pulled off a spectacular goal thanks to some incredible passing. On the fifth and game-winning goal, Bryan Bickell had the puck just over the center ice line and simply needed to dump it into the Ducks’ end so that the Hawks could get a line change. Instead of making the sure and safe play, he chose to take a slap shot (presumably directed at Frederik Andersen) that hit a Duck defenseman, dropped right to the stick of Jakob Silfverberg, and the next thing you knew Anaheim had a two on one going the other way. Game over. Those plays cannot happen if you’re Sharp and Bickell. Speaking of Bryan Bickell, how awful has he been? He’s getting out-muscled along the boards with regularity and is providing next to nothing for the Hawks. There’s no way that the coaching staff isn’t noticing this. Maybe his costly turnover in overtime last night will finally get him benched. In his defense, it looks like he’s playing injured and that could have something to do with his ineffectiveness. If that’s the case, he shouldn’t be playing. Dress Versteeg, Nordstrom, or even Ryan Hartman. Someone who can actually contribute to the team. At this stage of the series, Joel Quenneville should be putting his absolute best lineup on the ice. No one should be blaming Corey Crawford for this loss. He had no chance on either of the Ducks’ first two or last two goals, and was likely screened on their third. He came up with some huge saves in the first period and never really looked bad in the game. It was his teammates that hung him out to dry. Lastly, the powerplay of the Hawks wasn’t good enough. They were 0/2 with the man advantage. They did generate a few chances, but never found the net. They have GOT to start scoring on the powerplay if they want to come back and win this thing. Not to keep picking on Bryan Bickell, but he shouldn’t be on the second PP unit. I know he’s a big body that can park in front of the net, but he can’t do anything else. Teuvo Teravainen, who just keeps getting better and better, should take his spot. He’s a play-maker creates scoring chances, and that’s what the second unit is lacking. Looking ahead to Game 6, the Blackhawks really should have some confidence in themselves. If they had even shown up just a little bit in the first period of Game 5, they probably win the game. They dominated the final 40 minutes and found a way to tie the game after trailing 3-0 at one point. Jonathan Toews did another Jonathan Toews thing by scoring two goals in the final two minutes to tie the game. It was truly a miraculous finish to regulation. I’m not a huge believer in momentum carrying over from one game to the next, but the fact that the Blackhawks were able to outplay the Ducks over the final two periods and erase a 3-0 deficit in Game 5 should make them feel pretty good about themselves heading into Game 6 on home ice. The Blackhawks are not a team that gets rattled or “scared” while facing elimination. Jonathan Toews even said following last night’s loss that the Hawks almost seem to play better when their backs are up against the wall. We’ve seen them come back in series multiple times before, and I wouldn’t be in the least bit surprised if they find a way to do it again now. If you’re looking for someone who might be scared, look in the direction of Frederik Andersen. He was awful in Game 5, and maybe his confidence is diminishing. If I’m the Hawks, I’m shooting early and often in Game 6. Knowing that with a loss they’ll be sent packing, I am fully expecting the Blackhawks to come out with everything they’ve got on home ice Wednesday night. Win that game and force Anaheim to defend home ice in a Game 7 yet again. In case you forgot, the Ducks were in this exact same position last year against L.A. in the second round. The Kings took Game 6, and then proceeded to blow out the Ducks in Anaheim in Game 7. It won’t be easy, but there’s no reason why the Blackhawks should doubt their chances of coming back and winning this series.